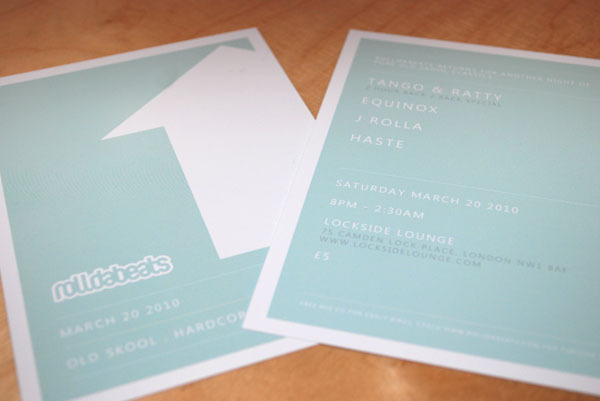 The flyers for the next RollDaBeats night turned up today and they’re looking cool! Insession kicks off its summer programme on Saturday the 16th May by inviting three of our favourite patrons to get behind the decks for another alternative throwdown. 1xtra’s premier dnb host Bailey will be joining us as he’s a long overdue guest and knows exactly what we expect down at the sessions. He’s a multi award winning radio presenter as well as long standing resident DJ for Goldie’s Metalheadz outfit and Fabio’s night Swerve. Bailey’s true passion lies with being the best selector possible and we’ve no doubt that’ll apply to his styles outside dnb. Another session regular, Zero T, has agreed to come back and refresh our minds with his varied influences. Zero T is arguably the brightest rising star out of Dublin’s dnb scene and his influences range from the early 90s conscious hip-hop sounds of Pete Rock, Premier and ATCQ to UK trip hop artists and labels such as Mowax, Ninja Tune and Massive Attack. Add to that a great knowledge of 70s soul, funk and blue note jazz and you can imagine why we’re looking forward to his return. Finally Mr Haste will be getting involved, bringing evidence to the table of his serious vinyl addiction and unhealthy knowledge of archiving records. We’re not sure exactly what to expect from Tom but do know he’s collected most styles known to man and is never afraid to play them! Also don’t forget to catch Valve recordings Craggz who will be road testing his new house productions and Bensamba who will be dropping more trademark brasilian broken beats for the early starters..